^ Japanese: ファイナルファンタジーXII, Hepburn: Fainaru Fantajī Tuerubu? ^ a b Square Enix, ed. (2006). Final Fantasy XII North American instruction manual. Square Enix. p. 12. ^ Square Enix, ed. (2006). Final Fantasy XII North American instruction manual. Square Enix. p. 14. ^ Square Enix, ed. (2006). Final Fantasy XII North American instruction manual. Square Enix. p. 15. ^ Square Enix, ed. (2006). Final Fantasy XII North American instruction manual. Square Enix. p. 19. ^ a b BradyGAMES, ed. (2006). Final Fantasy XII Official Strategy Guide. DKPublishing. p. 288. ISBN 0-7440-0837-9. ^ BradyGAMES, ed. (2006). Final Fantasy XII Official Strategy Guide. DKPublishing. pp. 41–42. ISBN 0-7440-0837-9. ^ a b BradyGAMES, ed. (2006). Final Fantasy XII Official Strategy Guide. DKPublishing. pp. 35–36. ISBN 0-7440-0837-9. ^ BradyGAMES, ed. (2006). Final Fantasy XII Official Strategy Guide. DKPublishing. pp. 38–39. ISBN 0-7440-0837-9. ^ BradyGAMES, ed. (2006). Final Fantasy XII Official Strategy Guide. DKPublishing. p. 37. ISBN 0-7440-0837-9. ^ a b BradyGAMES, ed. (2006). Final Fantasy XII Official Strategy Guide. DKPublishing. p. 29. ISBN 0-7440-0837-9. ^ a b c d e BradyGAMES, ed. (2006). Final Fantasy XII Official Strategy Guide. DKPublishing. p. 44. ISBN 0-7440-0837-9. ^ a b c d e BradyGAMES, ed. (2006). Final Fantasy XII Official Strategy Guide. DKPublishing. p. 58. ISBN 0-7440-0837-9. ^ a b Square Enix, ed. (2006). Final Fantasy XII North American instruction manual. Square Enix. p. 17. ^ a b BradyGAMES, ed. (2006). Final Fantasy XII Official Strategy Guide. DKPublishing. p. 18. ISBN 0-7440-0837-9. ^ BradyGAMES, ed. (2006). Final Fantasy XII Official Strategy Guide. DKPublishing. p. 20. ISBN 0-7440-0837-9. ^ Square Enix, ed. (2006). Final Fantasy XII North American instruction manual. Square Enix. p. 23. ^ Sage Knowledge 12 of 78 (Hybrid Gator Bestiary entry) Magicite - Common name for stones containing magickal power, or as it is commonly manifest, Mist. Square Enix (October 31, 2006). Final Fantasy XII. PlayStation 2. ^ Sage Knowledge 14 of 78 (Steeling Bestiary entry) Airships - Currently, they are one of the most popular forms of transportation in Ivalice. Square Enix (October 31, 2006). Final Fantasy XII. PlayStation 2. Ivalice - The region consisting of the three continents of Valendia, Ordalia, and Kerwon, blessed throughout with verdant natural landscapes and climatic conditions supporting a great variety of life. Square Enix (October 31, 2006). Final Fantasy XII. PlayStation 2. ^ Sage Knowledge 30 of 78 (Urstrix Bestiary entry) Ordalia - Continent on the western edge of Ivalice. The vast plains in the interior are home to the great Rozarrian Empire. To the east of Rozarria, the land is arid and largely desert. 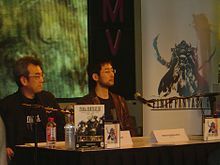 Square Enix (October 31, 2006). Final Fantasy XII. PlayStation 2. ^ Studio BentStuff, ed. (2006). Final Fantasy XII Scenario Ultimania (in Japanese). Square Enix. pp. 44–45. ISBN 4-7575-1696-7. ^ Studio BentStuff, ed. (2006). Final Fantasy XII Scenario Ultimania (in Japanese). Square Enix. pp. 48–49. ISBN 4-7575-1696-7. ^ BradyGAMES, ed. (2006). Final Fantasy XII Official Strategy Guide. DKPublishing. pp. 6–9. ISBN 0-7440-0837-9. ^ a b c d BradyGAMES, ed. (2006). Final Fantasy XII Official Strategy Guide. DKPublishing. pp. 10–15. ISBN 0-7440-0837-9. ^ Square Enix (October 31, 2006). Final Fantasy XII. PlayStation 2. Ondore: Prayer, too, for the noble Princess Ashe, who, wrought with Grief at her Kingdom's Defeat, has taken her own Life. Know also that Capt. Basch fon Ronsenburg, for Incitement of Sedition and the Assassination of H.R.M. King Raminas, has been found Guilty of High Treason and put to his Death. ^ Square Enix (October 31, 2006). Final Fantasy XII. PlayStation 2. Square Enix. Larsa: Vayne Solidor, the Consul, is my brother. ^ Square Enix (October 31, 2006). Final Fantasy XII. PlayStation 2. Ghis: Come now, come now. Have you forgotten your manners? This is hardly the courtesy due... The late Princess Ashelia B'nargin Dalmasca. / Vaan: Princess?! ^ Square Enix (October 31, 2006). Final Fantasy XII. PlayStation 2. Ondore: You may yet be a Princess, but without proof of your identity, you are powerless. You will remain with me. We do nothing till the time is right. ^ Square Enix (October 31, 2006). Final Fantasy XII. PlayStation 2. Ashe: I'm going to retrieve the Dawn Shard. It's the proof that I need. I know where it's hidden. I'll return his airship later. ^ Square Enix (October 31, 2006). Final Fantasy XII. PlayStation 2. Larsa: Lady Ashe, let us go to Bur-Omisace. With the blessing of His Grace the Gran Kiltias Anastasis...you may rightly wear your crown, and declare the restoration of the Kingdom of Dalmasca. As Queen, you can call for peace between the Empire and Dalmasca...and stop Marquis Ondore. ^ Square Enix (October 31, 2006). Final Fantasy XII. PlayStation 2. Anastasis: In Archadia, Larsa. In Rozarria, Al-Cid. They dream not of war. Should empire join with empire, the way will open for a new Ivalice in our time. ^ Square Enix (October 31, 2006). Final Fantasy XII. PlayStation 2. Larsa: Dalmasca would be the battlefield! What if nethicite were used on Rabanastre? You know my brother would do this! ^ Square Enix (October 31, 2006). Final Fantasy XII. PlayStation 2. Al-Cid: The Emperor Gramis is no more. His life was taken. ^ Square Enix (October 31, 2006). Final Fantasy XII. PlayStation 2. Cid: Am I right? I am, aren't I. A worthy daughter of the Dynast-King! You would do well to go to Giruvegan. Who knows? You may receive a new Stone for your trouble. ^ Square Enix (October 31, 2006). Final Fantasy XII. PlayStation 2. Gerun: Seek you the Sun-cryst, slumb'ring star. In tower on distant shore it dreams. The mother of all nethicite, the source of its unending power. ^ Square Enix (October 31, 2006). Final Fantasy XII. PlayStation 2. Gerun: Now take this sword, this Treaty-Blade. Occurian seal, mark of your worth. Cut deep the Cryst and seize your Shards. Wield Dynast-King's power! Destroy Venat! ^ Square Enix (October 31, 2006). Final Fantasy XII. PlayStation 2. Square Enix. Bergan: Hark! Ivalice hails her true Dynast-King, Vayne Solidor! He shall defy the will of the gods, and see the reins of History back in the hands of Man! ^ Square Enix (October 31, 2006). Final Fantasy XII. PlayStation 2. Square Enix. Venat: Indeed. What claim does Gerun have on history's reins...seated on throne immortal, rent from time? ^ Square Enix (October 31, 2006). Final Fantasy XII. PlayStation 2. Square Enix. Vayne: We conquered two kingdoms, that you might study these "baubles". / Cid: Oh, I am grateful for the sacrifice. Without it, manufacted nethicite would have eluded us—an unrivaled weapon, I warrant you. ^ Square Enix (October 31, 2006). Final Fantasy XII. PlayStation 2. Ashe: In all Dalmasca's history, not once did we rely on the Dusk Shard. Our people resolved never to use it, though their need might be dire. That was the Dalmasca I wanted back... I will destroy the Sun-cryst! I will discard the Stone! ^ Square Enix (October 31, 2006). Final Fantasy XII. PlayStation 2. Gabranth: Yes, it was I who wore Basch's face - who cut down the Life of Dalmasca. Lady Ashe! Your father's murderer is here! ^ Square Enix (October 31, 2006). Final Fantasy XII. PlayStation 2. Vayne: Observe well, Larsa. Watch and mark you the suffering of one who must rule, yet lacks the power. / Larsa: No. No, brother. I will not. Though I lack your power, I will still persist. ^ Square Enix (October 31, 2006). Final Fantasy XII. PlayStation 2. Ashe: This is Ashelia Dalmasca. I confirm what Judge Magister Gabranth and Larsa Solidor have said here. Please. Stand down your attack. The war is over. Ivalice looks to the horizon. A new day has dawned. We are free! ^ Square Enix (October 31, 2006). Final Fantasy XII. PlayStation 2. 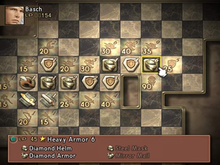 Balthier's note: Something more valuable: the Cache of Glabados. I await in Bervenia. ^ Studio BentStuff, ed. (2006). "「FFXII」開発スタッフインタビュー6". Final Fantasy XII Scenario Ultimania (in Japanese). Square Enix. ISBN 4-7575-1696-7. ^ Ricciardi, John (March 15, 2006). "Final Fantasy XII Launches in Japan". 1UP.com. Retrieved July 24, 2007. ^ Kawamura, Naruhiro (January 22, 2001). "FF11、PCでも発売、FF12の制作を開始". Mainichi. Archived from the original on April 13, 2001. ^ Niizumi, Hirohiko (August 1, 2005). "FFXII producer steps down". GameSpot. Archived from the original on November 8, 2012. Retrieved March 10, 2007. ^ Gantayat, Anoop (August 1, 2005). "Changes to Final Fantasy XII Staff". IGN. Archived from the original on November 6, 2012. Retrieved September 1, 2006. ^ Square Enix, ed. (2006). Final Fantasy XII North American instruction manual. Square Enix. p. 40. ^ EGM staff (2007). Electronic Gaming Monthly 216, June 2007. Ziff Davis Publishing Holdings Inc. p. 53. ^ a b c Interview with Hiroyuki Ito Final Fantasy XII Collector's Edition Bonus DVD (DVD). Tokyo: Square Enix. 2006. ^ Nickel, Thomas (2006). "Interview with Hiroshi Minagawa". g-wie-gorilla.de. Archived from the original on October 5, 2007. Retrieved June 17, 2007. ^ Niizumi, Hirohiko (November 19, 2003). "Final Fantasy XII gets star treatment in Tokyo". GameSpot. Archived from the original on May 15, 2006. Retrieved November 2, 2006. ^ a b c d IGN Staff (November 20, 2003). "Final Fantasy XII Q&A (page 2 of 4)". IGN. Archived from the original on September 28, 2005. Retrieved September 2, 2006. ^ a b "Final Fantasy XII Interview". Final Fantasy Shrine. November 19, 2003. Retrieved November 2, 2006. ^ a b Sugawara, Aki (November 20, 2003). "Feature: A Final Fantasy XII Interview (page 2)". GamePro. Archived from the original on October 3, 2009. Retrieved December 14, 2006. ^ a b "Sortie française de Final Fantasy XII : le Compte rendu" (in French). ffring.com. February 28, 2007. Archived from the original on May 2, 2007. Retrieved April 17, 2007. ^ a b IGN Staff (November 20, 2003). "Final Fantasy XII Q&A (page 1 of 4)". IGN. Archived from the original on August 22, 2006. Retrieved September 2, 2006. ^ Miwa, Shoda [@shodamiwa] (June 20, 2013). "「FFXII」のチーム" (Tweet). Retrieved July 8, 2013 – via Twitter. ^ Loor, Jeffrey (November 1, 2006). "The latest installment." Ars Technica. Archived from the original on April 11, 2009. Retrieved March 6, 2007. ^ Shoemaker, Brad (May 11, 2006). "E3 06: Final Fantasy XII English Version Update". GameSpot. Archived from the original on October 27, 2006. Retrieved March 10, 2007. ^ a b Interview with Alexander O. Smith Final Fantasy XII Collector's Edition Bonus DVD (DVD). Tokyo: Square Enix. 2006. ^ Alfonso, Andrew (September 23, 2006). "TGS 2006: Final Fantasy XII Dev Team Interview". IGN. Archived from the original on November 2, 2006. Retrieved November 4, 2006. ^ Parish, Jeremy (March 11, 2007). "GDC 2007: The Square-Enix Approach to Localization". 1up.com. Archived from the original on September 7, 2016. Retrieved March 2, 2011. ^ Gantayat, Anoop (December 18, 2005). "Hands On: Final Fantasy XII". IGN. Archived from the original on December 29, 2006. Retrieved March 10, 2007. ^ Cordeira, Jim (September 13, 2006). 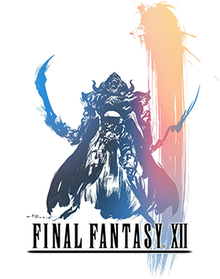 "Final Fantasy XII kicks off at DigitalLife". Gaming Age. Archived from the original on August 22, 2007. Retrieved September 13, 2006. ^ "Final Fantasy XII Cosplay Contest 2006". Square Enix. September 14, 2006. Archived from the original on March 15, 2007. Retrieved September 14, 2006. ^ Parsons, Doug (December 22, 2008). "Record Breaking Final Fantasy Series". Guinness World Records. Archived from the original on June 2, 2009. Retrieved June 30, 2008. ^ Zero (March 31, 2009). "Rabanastre rendered in Unreal 3". Message Board Champion. Archived from the original on July 14, 2011. Retrieved March 18, 2011. ^ Gibson, Ellie. "Guinness lists top 50 games of all time". Eurogamer. Eurogamer. Archived from the original on February 25, 2013. Retrieved March 7, 2013. ^ Niizumi, Hirohiko (November 1, 2004). "Nobuo Uematsu leaving Square Enix". GameSpot. Archived from the original on November 4, 2004. Retrieved March 10, 2007. ^ IGN Music (October 24, 2006). "Twelve Days of Final Fantasy XII: Hitoshi Sakimoto Interview Part I". IGN. Archived from the original on February 12, 2007. Retrieved March 10, 2007. ^ Gantayat, Anoop (July 30, 2005). "Square Enix 2005: FFXII Songstress Revealed". IGN. Archived from the original on August 24, 2006. Retrieved September 1, 2006. ^ Gantayat, Anoop (March 16, 2006). "FFXII Jacks Shibuya". IGN. Archived from the original on August 24, 2006. Retrieved September 1, 2006. ^ Niizumi, Hirohiko (December 1, 2005). "Japanese Final Fantasy XII gets premium price". GameSpot. Archived from the original on January 7, 2007. Retrieved March 10, 2007. ^ Gann, Patrick (May 1, 2006). "Symphonic Poem "Hope"". RPGFan. Archived from the original on March 12, 2007. Retrieved March 10, 2007. ^ Schweitzer, Ben (June 17, 2006). "Final Fantasy XII OST". RPGFan. Archived from the original on March 7, 2007. Retrieved March 10, 2007. ^ Sullivan, Meghan (August 2, 2006). "Hitoshi Sakimoto - Final Fantasy XII Original Soundtrack: Limited Edition". IGN. Archived from the original on February 5, 2007. Retrieved March 10, 2007. ^ a b Gann, Patrick (May 1, 2006). "Angela Aki - Kiss Me Good-Bye". RPGFan. Archived from the original on May 15, 2007. Retrieved March 10, 2007. ^ Carle, Chris (October 20, 2006). "Twelve Days of Final Fantasy XII: Tofu Records Visit". IGN. Archived from the original on February 5, 2007. Retrieved March 10, 2007. ^ Gantayat, Anoop (January 6, 2006). "Final Fantasy XII PS2 Coming". IGN. Archived from the original on August 24, 2006. Retrieved September 1, 2006. 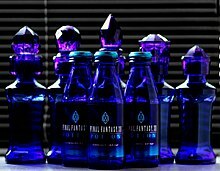 ^ "SCEJ、特殊デザインのPS2本体と「FF XII」のセット 「"PlayStation 2"FINAL FANTASY XII Pack」を発売" (in Japanese). January 6, 2006. Archived from the original on November 1, 2012. Retrieved February 4, 2012. ^ Winkler, Chris (February 17, 2006). "FFXII Memory Card Announced". RPGFan. Archived from the original on May 10, 2007. Retrieved March 24, 2007. ^ Winkler, Chris (January 15, 2006). "FFXII PS2 Controller Announced in Japan". RPGFan. Archived from the original on May 10, 2007. Retrieved March 24, 2007. ^ Gantayat, Anoop (January 19, 2006). "Final Fantasy XII Drink Dated". IGN. Archived from the original on August 25, 2006. Retrieved September 1, 2006. ^ ファイナルファンタジー12 1 (in Japanese). ISBN 4757518307. ^ ファイナルファンタジー12 5 (in Japanese). ISBN 4757526504. ^ a b Studio BentStuff (April 21, 2006). "「ファイナルファンタジーXII シナリオアルティマニア」 「ファイナルファンタジーXII バトルアルティマニア」は 合計1100ページ超の大ボリューム！". Studio BentStuff. Archived from the original on April 7, 2007. Retrieved March 25, 2007. ^ Studio BentStuff (October 31, 2006). "「ファイナルファンタジーXII アルティマニアΩ」続報 表紙は吉田明彦氏の描き下ろし！　本の内容も超充実！". Studio BentStuff. Archived from the original on February 4, 2007. Retrieved March 25, 2007. ^ Team Animefringe (December 1, 2005). "The Legacy of Final Fantasy VII". animefringe.com. Archived from the original on October 6, 2014. Retrieved March 24, 2007. ^ Studio BentStuff (August 6, 2007). "「ファイナルファンタジーXII インターナショナル ゾディアックジョブシステム アルティマニア」表紙公開". Studio BentStuff. Archived from the original on August 24, 2007. Retrieved August 18, 2007. ^ Sinclair, Brendan (October 31, 2006). "Final Fantasy XII lands at retail". GameSpot. Archived from the original on September 29, 2007. Retrieved March 10, 2007. ^ Hatfield, Daemon (October 31, 2006). "Final Fantasy Ships for the XIIth Time". IGN. Archived from the original on January 24, 2007. Retrieved March 10, 2007. ^ "Final Fantasy XII Play Arts" (in Japanese). Square Enix. January 26, 2007. Archived from the original on August 1, 2008. Retrieved March 28, 2007. ^ Jenkins, David (March 24, 2006). "Japanese Sales Charts, Week Ending March 19". Media Create. Archived from the original on August 5, 2011. Retrieved August 14, 2006. ^ "Square Enix Conference Report". RPGFan. May 24, 2006. Archived from the original on September 8, 2006. Retrieved September 1, 2006. ^ "Square Enix Announces Record Shipment With Final Fantasy XII". Square Enix. November 6, 2006. Archived from the original on August 2, 2011. Retrieved November 7, 2006. ^ "PS2 2006 Year in Review". IGN. 2006. Archived from the original on February 22, 2011. Retrieved March 6, 2006. ^ "2007 profile" (PDF). Square Enix. October 2007. p. 6. Archived (PDF) from the original on April 15, 2009. Retrieved April 28, 2008. ^ "「ハリウッド映画に負けていますか？」 スクウェア・エニックスプロデューサー". November 25, 2009. Archived from the original on May 5, 2015. Retrieved December 12, 2018. ^ a b "Final Fantasy XII for PlayStation 2 Reviews". Metacritic. CBS Interactive. Archived from the original on December 29, 2017. Retrieved December 7, 2007. ^ a b "Final Fantasy XII: The Zodiac Age for PlayStation 4 Reviews". Metacritic. CBS Interactive. Retrieved July 2, 2018. ^ a b "Final Fantasy XII: The Zodiac Age for PC Reviews". Metacritic. CBS Interactive. Retrieved July 2, 2018. ^ Gray, William. "Final Fantasy XII - Review". AllGame. Archived from the original on December 10, 2014. Retrieved March 21, 2017. ^ "Review: Final Fantasy XII (page 74)". Edge Magazine. Future plc. December 2006. ^ Fahey, Rob (October 31, 2006). "Final Fantasy XII". Eurogamer. Archived from the original on December 18, 2008. Retrieved December 7, 2007. ^ a b Lumb, Jonathan (March 8, 2006). "FF XII Scores Perfect In Famitsu". 1UP.com. Archived from the original on February 18, 2012. Retrieved August 13, 2006. ^ "Review: Final Fantasy XII". GameTrailers. October 30, 2006. Archived from the original on June 2, 2009. Retrieved March 20, 2006. ^ a b Kasavin, Greg (October 31, 2006). "Final Fantasy XII for PlayStation 2 Review". GameSpot. Archived from the original on March 2, 2007. Retrieved March 4, 2007. ^ "1UP.com review". 1UP.com. October 27, 2006. Retrieved February 9, 2009. ^ "Final Fantasy XII". Electronic Gaming Monthly. EGM Media: 126. November 2006. ^ Juba, Joe (October 30, 2006). "Game Informer review". Game Informer. Archived from the original on June 21, 2009. Retrieved February 9, 2009. ^ a b Dunham, Jeremy (October 27, 2006). "Final Fantasy XII review". IGN. Archived from the original on February 28, 2007. Retrieved March 4, 2007. ^ "Review: Final Fantasy XII (page 68)". PlayStation Official Magazine (UK). Future plc. January 2007. ^ a b "Final Fantasy XII is Edge's game of the year". Edge Online. December 19, 2006. Archived from the original on January 26, 2007. Retrieved March 10, 2007. ^ a b 速報！　ファミ通ゲームアワード2006開催！　各受賞タイトルを一挙発表！ (in Japanese). Famitsu.com. April 20, 2007. Archived from the original on June 9, 2009. Retrieved March 20, 2010. ^ a b "Awarded Games: Final Fantasy XII". Computer Entertainment Supplier's Association (CESA). Archived from the original on May 19, 2011. Retrieved January 19, 2010. ^ a b "GameSpot's Best Games and Worst Games of 2006". GameSpot. 2006. Archived from the original on January 15, 2007. Retrieved March 9, 2007. ^ a b IGN Staff (2006). "IGN.com presents the Best of 2006". IGN. Archived from the original on January 10, 2007. Retrieved March 9, 2007. ^ Albiges, Luke (April 18, 2006). "Final Fantasy XII review". Eurogamer. Archived from the original on January 25, 2009. Retrieved August 14, 2006. ^ IGN Staff (July 18, 2006). "Top 10 Tuesday: Best Art in Videogames". IGN. Archived from the original on August 11, 2006. Retrieved August 14, 2006. ^ Joynt, Patrick (November 1, 2006). "Newtype USA / Reviews / Final Fantasy XII". Newtype. Archived from the original on May 21, 2007. Retrieved January 17, 2007. ^ Wales, Matt (October 26, 2006). "Square Talks Firsts for Final Fantasy XII". IGN. Archived from the original on January 24, 2007. Retrieved June 28, 2007. ^ Verlet, Nicolas (October 24, 2006). "Interview : Akitoshi Kawazu (FF XII)" (in French). Gamekult.com. Archived from the original on July 15, 2007. Retrieved July 17, 2007. ^ "GameSpy's Game of the Year 2006". GameSpy. Archived from the original on October 18, 2012. Retrieved March 10, 2007. ^ IGN Staff (2006). "IGN.com presents the Best of 2006". IGN. Archived from the original on January 10, 2007. Retrieved March 9, 2007. ^ "SCEJ、「PlayStation Awards 2006」受賞タイトルを発表PS2「ファイナルファンタジーXII」がダブルプラチナプライズ" (in Japanese). GAME Watch. July 26, 2006. Archived from the original on July 3, 2009. Retrieved March 20, 2010. ^ "「PlayStation Awards 2006」受賞タイトルについて" (in Japanese). Sony Computer Entertainment Inc. July 25, 2006. Archived from the original on September 9, 2009. Retrieved March 20, 2010. ^ "Corporate History". SQUARE ENIX. Archived from the original on April 23, 2012. Retrieved January 19, 2010. ^ "Raison d'etre". Japanesque Modern Committee. January 19, 2006. Archived from the original on July 22, 2011. Retrieved May 18, 2013. ^ "The 10th Annual Academy of Interactive Arts and Sciences Awards". Academy of Interactive Arts & Sciences. Archived from the original on October 22, 2010. Retrieved January 19, 2010. ^ "7th Annual Game Developers Choice Awards". Game Developers Choice Awards. Archived from the original on October 23, 2010. Retrieved January 19, 2010. ^ "Games Nominations 2007". British Academy of Film and Television Arts. Archived from the original on January 31, 2010. Retrieved March 21, 2010. ^ Surette, Tim (December 9, 2006). "Oblivion nabs Spike TV top honors". GameSpot. Archived from the original on October 20, 2012. Retrieved May 18, 2013. ^ "Nominees and Winners: 2006 11th Annual SATELLITE™ Awards". International Press Academy. Archived from the original on January 7, 2010. Retrieved March 21, 2010. ^ Boulette, Bryan (May 9, 2007). "Final Fantasy IV Remake, XII International Announced". RPGamer. Archived from the original on September 30, 2007. Retrieved May 9, 2007. ^ Hirohiko Niizumi (May 3, 2007). "Final Fantasy XII International Zodiac Job System". GameSpot. Archived from the original on September 9, 2015. Retrieved May 29, 2007. ^ Allen, By Jason. "Square Enix Announces Final Fantasy XII: International Zodiac Job System". IGN. Archived from the original on August 20, 2016. Retrieved August 1, 2016. ^ IGN Staff (September 21, 2006). "TGS 2006: Final Fantasy XII Update". IGN. Archived from the original on October 7, 2006. Retrieved September 21, 2006. ^ Winkler, Chris (December 13, 2006). "Square Enix announces FF Tactics for the PSP and Another New FFT Game". RPGFan. Archived from the original on February 23, 2012. Retrieved January 10, 2007. ^ Robinson, Andy (January 18, 2010). "Final Fantasy XII spin-off leaked". Computer and Video Games. Archived from the original on October 18, 2012. Retrieved January 19, 2010. ^ Albihn, Björn (September 7, 2009). "Björn Albihn - Character Artist". Archived from the original on September 23, 2009. Retrieved September 22, 2009. ^ Dustin, Quillen (August 20, 2009). "GRIN Was Working on an Unannounced Final Fantasy Project". 1UP.com. Retrieved September 22, 2009. ^ "GRIN's Final Fantasy spin-off still in development". GamesIndustry.biz. September 21, 2009. Archived from the original on January 5, 2010. Retrieved September 22, 2009. ^ "Final Fantasy XII spin-off Fortress 'suspended'". VideoGamer. June 9, 2011. Archived from the original on January 20, 2015. Retrieved July 4, 2011. ^ a b Goldfarb, Andrew (June 6, 2016). "E3 2016: Final Fantasy XII: The Zodiac Age Announced". IGN. Archived from the original on June 9, 2016. Retrieved June 10, 2016. ^ Sato (January 31, 2017). "Final Fantasy XII: The Zodiac Age Releasing On July 11 In The West, July 13 In Japan". Siliconera. Archived from the original on January 31, 2017. Retrieved January 31, 2017. ^ Sato (April 13, 2017). "Revisit Ivalice In Final Fantasy XII: The Zodiac Age Original Soundtrack Trailer". Siliconera. Archived from the original on April 25, 2017. Retrieved May 11, 2017. ^ Webster, Andrew (July 11, 2017). "Final Fantasy XII deserves its second chance". The Verge. Retrieved July 27, 2017. ^ "Best of 2017 Awards: Best Remake/Remaster". IGN. December 20, 2017. Retrieved January 8, 2018. ^ Game Informer staff (January 4, 2018). "Game Informer's Best Of 2017 Awards (Page 4)". Game Informer. Retrieved January 8, 2018. ^ Wallace, Kimberley (January 7, 2018). "The 2017 RPG Of The Year Awards (Page 2)". Game Informer. Retrieved January 8, 2018. ^ O'Conner, Alice (January 11, 2018). "Final Fantasy XII coming to PC on February 1st". Rock Paper Shotgun. Retrieved January 11, 2018. ^ Knezevic, Kevin. "Final Fantasy X And XII Release Date Announced For Switch And Xbox One". GameSpot. Retrieved January 10, 2019. ^ "VIRTUOS CO-DEVELOPING FINAL FANTASY TITLES WILL DEBUT ON NINTENDO SWITCH AND XBOX ONE IN 2019". December 1, 2018. Retrieved January 10, 2019. 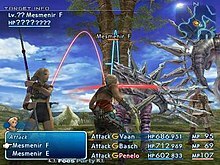 Wikimedia Commons has media related to Final Fantasy XII.